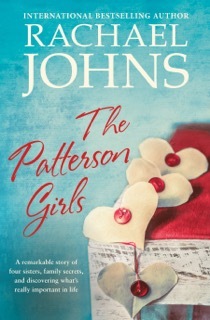 Popular Australian author Rachael Johns is best known for her rural romance and farm-lit novels, however The Patterson Girls is her first foray into a genre she herself calls 'contemporary life lit'. Basically it's a story about four sisters, who grew up in a motel run by the family in a small town 3.5 hours from Adelaide, near Port Augusta. Grieving the loss of their mother six months earlier, each sister has their own unique personality, one living in London, one in USA, one in Melbourne and the other in Perth. I think my favourite part of The Patterson Girls was the fact they all grew up in a motel. I grew up in a small town general store and could definitely relate to their upbringing. The motel in the novel has seen better times, and I was really hoping for a 'makeover.' This is one of my favourite sub-plots in a book, where a run down building is cleaned up and renovated. I won't spoil the story, but my needs were satisfied here as well. The sisters aren't a cohesive and trusting unit in the beginning and their dynamics and personal troubles were interesting to discover. In fact, I found myself enjoying The Patterson Girls much more than I'd expected, having been initially concerned there might be too much romance. The ending was also satisfying and who doesn't love a family secret or a family curse? My only reservations were that the sisters drank too much wine (oh well, no harm there right?) and I think the title should have been Patterson's Curse instead of The Patterson Girls. Feel free to visit Rachael’s website.